Just Between Friends Tulsa- shop, sell, save, smart! Be our JBF family as a consignor &/or shopper! Fall Sale~Sept. 8-14th. It's our pleasure! Come Shop & Save With Us! Thanks Tulsa, for making JBF Tulsa a shining SUCCESS in our community! Our NEXT sales event is our Fall Sale set for Sept. 8-14th @ Expo Square. The sale is OPEN to EVERYONE! Your items have more value w/ JBF Tulsa. To learn more click on the Consignor Details. Happy Selling! Happier Shopping! Bring your BFF to the largest shopping experience in Tulsa! It's a savings extravaganza! You'll find aisles of the best in gently-loved and new items at great savings! We PROMISE, Your budget will run out before the bargains do. We gladly accept cash, checks, debit cards, Visa, Mastercard, and Discover for payment. Please consider joining our JBF NATION! 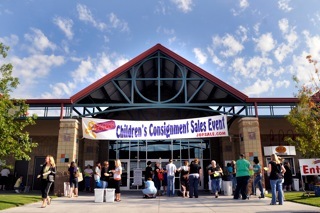 - Use our LOGIN to register~participate as a Consignor, Volunteer, First Time Mom or Shopper. Your account it is always open, so you can start tagging now! Consignors can select shifts ranging from 5 to 12 hours. Huge Benfits to volunteering; Adding value & Shopping EARLY! For only five hours of help, consignors can add value to their items by receiving an extra 10% of their sold items and shop before the public. Twelve hour volunteers shop starting at 9 a.m. on Sat. Sept 7th, the rest begin @ 11 a.m. and go until 9 p.m. depending on volunteer hours. Registered First Time Moms & two of their guests shop early, beginning at 6 p.m. on the Saturday before we open to the public. Happy shopping! Free Gift to the first 10 customers. (1 per adult shopper) Also, Buy 3 get 1 FREE on Books! Wild Wednesday with Scavenger Hunts! ALL items with NO star on the tag are discounted 25% Off. ALL items w/ NO Star are discounted 50% Off. Sunday, Sept. 15: 5-8 p.m.
Plan ahead for the next JBF Tulsa event, we would love to have you consign, volunteer or shop with us! "Well organized. GREAT customer service for Consignors & shoppers." Easy and love cleaning out closets! READY to make $, you can SELL your items too!